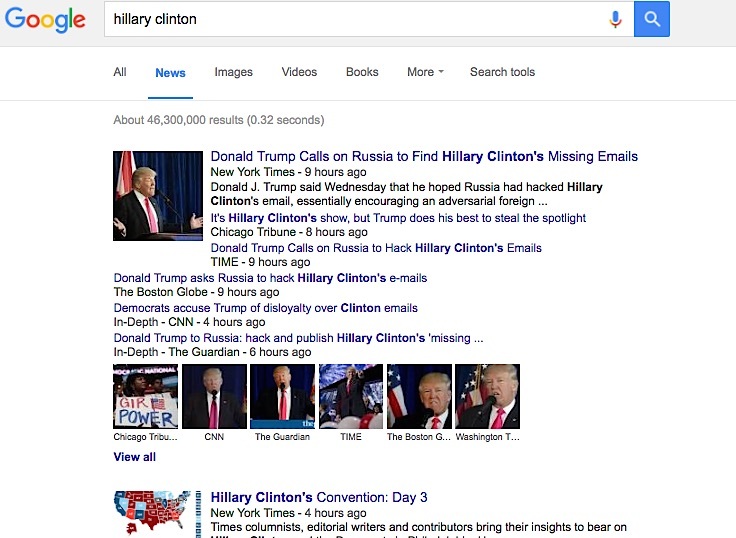 Look who owns the Google result for "Hillary Clinton" as of tonight at 10:00 pm. If you've read my Twitter stream this summer you've seen various levels of disdain for Donald Trump. Sometimes it's important to push back when someone peddles bs. Sometimes it's necessary to beat back loud, noxious, memorable exclamations with something just as loud and just as memorable. But sometimes sensationalism is a trick to control the conversation. I fell for that trick today, Tweeting too much when the GOP candidate "walk[ed] up to the line of treason" and stole attention from the country's history-making nomination of the first female presidential candidate from a major party.